Hundreds of participants joined in a dance marathon Saturday at Southern Illinois University Edwardsville to help raise funds and awareness for St. Louis children’s hospitals. SIUE's Fourth Dance Marathon raised approximately $29,000 according to Sarah Laux, assistant director for Community Engagement at SIUE’s Kimmel Student Involvement Center. The community project raised money for Children’s Miracle Network of Greater St. Louis, which provides support to St. Louis Children’s Hospital and the SSM Health Cardinal Glennon Children’s Hospital. The marathon started at noon Saturday, Feb. 27 and ended at midnight Sunday, Feb. 28. 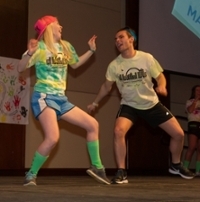 L-R: Emma McCann, a junior in the School of Education, Health and Human Behavior; and Dylan Stanley, a senior in the College of Arts and Sciences, put their heart and feet into the dance number. SIUE students enjoy a good time, dancing the hours away.